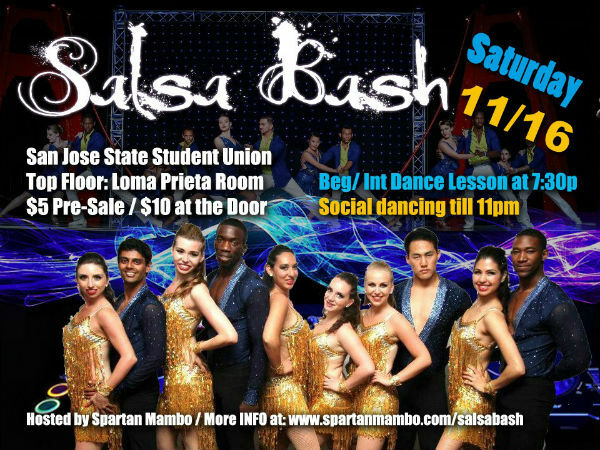 Spartan Mambo’s annual “Salsa Bash” social is coming soon! The event will be held on Saturday, November 16th at the Loma Prieta Room in the Student Union. There will be beginner & intermediate salsa lessons taught starting 7:30pm, and social dancing until 11pm. There will also be a debut performance of Spartan Mambo’s latest routine! The event is just $10 at the door, or you can purchase pre-sale tickets from any member of the team. Come join us for a fun night of dancing! You can find more info about the event on our Facebook invite.